Mattel introduced the Movie Masters line to go with Christopher Nolan's second Bat-movie, The Dark Knight, but they wasted no time in stepping backwards to cover the first movie, as well. When it was announced that Scarecrow was going to be the villain for Batman Begins, it was seen as a strange move - why start with him, rather than one of the more recognizable villains? It definitely sent the message that this was going to be an entirely different kind of Batman film... unless you were old enough and geek enough to remember that after Batman & Robin, the fifth film in the series was going to have Scarecrow as its villain (with Jeff Goldblum, still riding high on all that Jurassic Park/​Independence Day good will, rumored for the role*). That would be like if, after Sony axed Sam Raimi's plans for Spider-Man 4, they had rebooted it and still had Andrew Garfield fighting the Vulture. The one concession Batman Begins made to Scarecrow's traditional look is his mask. Apparently Christopher Nolan didn't even want that, but David S. Goyer talked him into it. It's just a burlap sack with eye holes, but you can tell that there's an air filter covering his nose and mouth under there - he's not immune to his own toxin, like in the comics. Scarecrow was at his most Scarecrowiest during the riot at the end of the film. 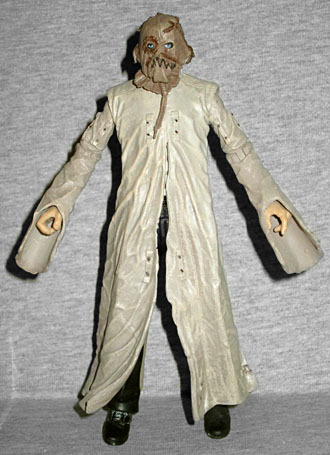 Having been committed to Arkham Asylum after his capture, Dr. Crane was wearing a straitjacket by then, so this figure is as well. 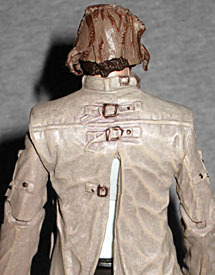 The body beneath the jacket is the same that the Gotham City Thug used, because even back then Mattel was into recycling that mold for everything they could. It's okay, all you can really see are his shins and feet, so who cares what the body is under there? The straitjacket is a separate PVC piece that fits down over the body, and it really does look great. The wrinkles in the sculpt give us a real feel for the weight and fabric of the "cloth" it's made from, and the various straps and buckles on it are completely sculpted. There are vertical straps of material that are sculpted to look like they're riveted on, and they create loops that a thicker binding could be fed through in order to restrain the inmate who's wearing it; these sculpted straps are are present on the chest and above the knees, and can also be found on the front, back and outsides of the upper arms. More typical buckles are found on the back of the jacket, but shouldn't there be some kind of restraint somewhere near the hands, as well? Normally a toy wearing a brown hood and a beige dress wouldn't count as the "colorful" entry in the line, but when you're sharing shelf space with Batman, Batman variants, Survival Suit Bruce, and the Gotham City Thug, "colorful" is a relative term. When I went to grab the figure for this review, there was (of course) some chalking on the figure - proving how unpredictable that problem is, it had affected one of his shoes, but not the other. 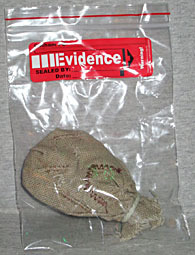 This figure is old enough that it still came with the "crime scene evidence" accessory. Remember that garbage? He comes with a Scarecrow mask that's obviously the wrong size to interact with any toy that's ever been made. Thanks, stupid! And hey, speaking of stupid, how ridiculous is it that while most of the joints match up with what we've seen on the other Batman Movie Masters, he has no biceps swivels? That's limiting! *Yes, Joel Schumacher has since revealed that he was going to cast Nicholas Cage, but no one knew that at the time. The fan rumors said Goldblum. **Not Henri Ducard, Ra's al Ghul.